I'm definitely more drawn to the Wild Watermelon but I know for a fact that I'll be wearing the Juicy Papaya more! I seem to wear more coral/orange-y lipsticks and leave the more vibrant colors for a rare/special day! 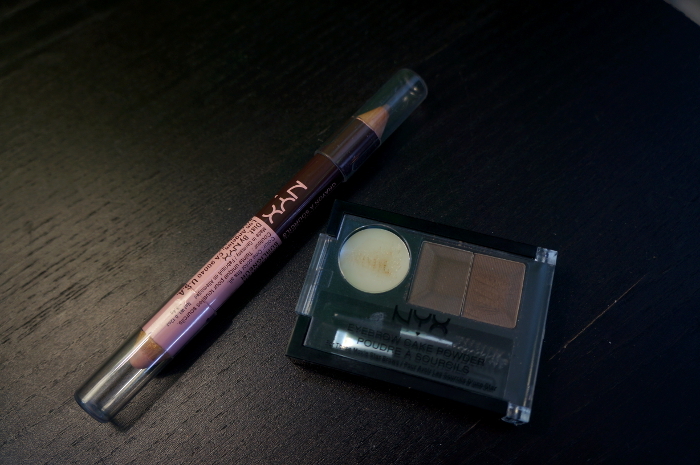 I love the London Drugs carries NYX. It seems to be the only place in Edmonton where I can seem to find this brand! I'm not a huge fan of the eye brow kit, I find that the powder is too fine that it barely shows up through my natural eye brows. The Push Up Bra for the Brows pencil is another story. I find the pencil to fill in just a tad too soft but the highlighter is amazing! It's the perfect shade and flows on very nicely! I've been using it everyday since I got it! I've been using this palette religiously. A while ago, I was going through a phase were I'd wearing eye shadow everyday! Then I stopped and used it whenever Israel and I would go out for a date or something special. But since having my hands on this palette, I've been wearing it everyday! I know that there are a lot of smokey eye palettes out there, but there are so many that don't give enough color choices or it's either a casual day smokey eye or a really dark smokey eye. I love that this palette mixes both and gives you many options to choose from! I also find that I don't get too much fallout! I'm definitely in love with this palette! I'm not a huge fan of cream blushes but when I saw the color of this stick blush, I definitely wanted to try it out! It's a great product, it just requires a little bit of product and a lot of blending in. I don't think I'd get it again, but that's my personal choice with cream blushes! Great review, I really like the products! Great review, the Juicy Papaya color looks gorgeous! The lipstick colors are super cute! I need to get myself the red-orange. I had no idea revlon brought out new shades! I have to check them out - I loooove the lip butters! Yeah! I think there is only three new ones though? Really? I find that they are amazing for moisture! I have almost all of them!